Rob Mercer is the director of the Miami Valley UFO Society, an Ohio-based UFO group. In 2013 he discovered an internet advertisement selling Blue Book pics and documents and he bought the set. The ad was from Centerville, which is located south of Dayton. It stated that the materials were apparently the property of an Air Force officer who was assigned to Blue Book. They were found behind a pile of lumber bought at auction in a garage in Fairborn, Ohio. And yes, they came from the abandoned UFO holdings of 2nd Lt. Carmon L. Marano, who was the last chief of Project Blue Book, between February 1969 and January 1970. I emailed Mr. Mercer and explained what Project FOTOCAT is and he, displaying an immense sense of collaboration, has started to transfer to our digital files high-resolution scans of a large amount of UFO (and IFO) photographs resting in those archives. Luckily, this material is not lost and thanks to the generosity of Mr. Mercer it will be included into the vast FOTOCAT database. 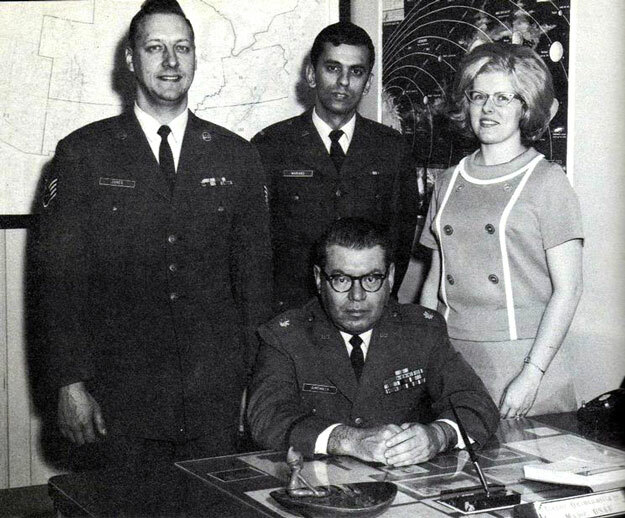 Blue Book Project personnel: Major Hector Quintanilla, sitting. Right standing behind him, Lt. Carmon Marano. Courtesy of Fran Ridge. One of the pictures from the BB files: North Sea (Norway), aboard the carrier USS Franklin D. Roosevelt, September 19, 1952, 16:00. © Wallace Litwin. 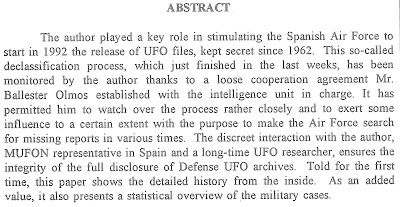 In 1992, by order of the chief of the Spanish Air Force Staff, all existing historical documentation on unidentified flying objects was moved from headquarters to the Air Operations Command (MOA) in the Torrejón de Ardoz AFB. 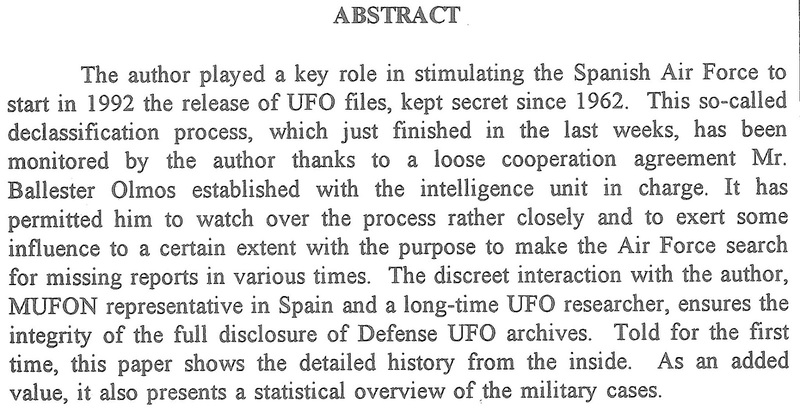 This initiated the declassification process of UFO files. At MOA, the Intelligence Section was in charge of the study of the information, the preparation of proper investigation protocols, and the final submission of files to the chief of the Staff to be declassified. Lieutenant colonels Ángel Bastida and Enrique Rocamora were the officers who dealt with this function. Between 1992 and 1999 nearly 2,000 pages of documents were reviewed relating to UFO sightings occurred between 1962 and 1995. All of the information was released and the resulting disclosed reports have been available for public consultation and copy in the library of the Air Force headquarters building in Madrid. The site’s cover page has added an interview with me in the January 2001 issue of the Revista Española de Defensa, the official journal of the Spanish Ministry of Defense. Lt. Col. Ángel Bastida (left) and Lt. Col. Enrique Rocamora flank V.J. 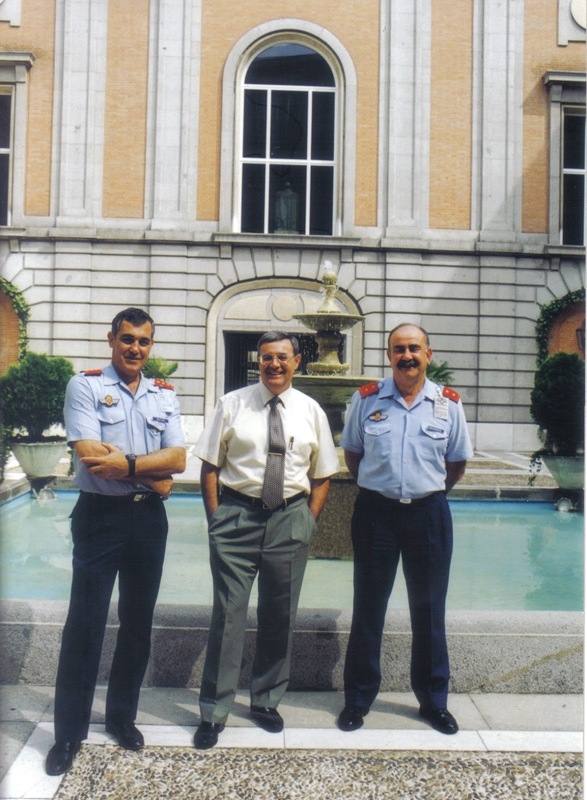 Ballester Olmos in the headquarters of the Spanish Air Force (Madrid), 1999. Video: M.P. Dávila. Image processing: David G. López/Mercedes Pullman. 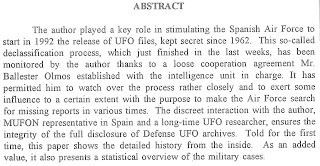 It is a well-known fact that in 2008 the British Ministry of Defense (MoD) started a 5-year process by transferring a sanitized copy of the existing UFO files to The National Archives (TNA), for placing online in the TNA website. 209 files were recognized at the time, amounting to about 50,000 pages. Those files were declassified and placed on the internet from May 2008 to June 2013, in 10 tranches, with Dr. David Clarke (folklorist, UFO researcher and writer) serving as consultant. Occasionally, some press and the usual sensationalist sources spread rumors about hidden files, implying a cover-up under way. It appears there are people who do not want to understand that the MoD closed its UFO hotline and the UFO “desk” at the Royal Air Force Air Command on December 1, 2009, with what that implies: UFOs, whatever they are (not a national security threat, that’s for sure) is not its cup of tea. With the logical consequence that its complete archives were transferred to the public domain. On June 30, 2016, MoD submitted 18 additional files concerning UFOs to The National Archives. “They are simply miscellaneous files that were overlooked, missed or fell outside the formal release process that led to the release to the 209 files already uploaded,” Dave Clarke informed to me recently. However, during the routine, checking process carried out by TNA ahead of the files release, it identified some redactions for which no approval had been given. The files were therefore returned to the MoD. Completion of the administrative process to obtain the approval required will take additional time and the earliest date that these files will now be transferred to TNA is March 2017. The MoD regrets the further delay in the availability of these files and indicates that there is no change to the information that will be made available to the public. When a decision is made on the release, it will be duly announced. Therefore, the next one will be the 11th and last tranche of UFO disclosure and every citizen will know about UFOs as much as (or we should say as little as) the Ministry of Defense of the United Kingdom knows. One can predict that when the ultimate files are released, the immediate cry will be “whitewash, cover-up”, because they do not contain the proof ET believers are convinced exists and is being hidden away. Therefore, claims will be made once again that these are not the real files and others are being withheld that contain the 'truth'. It is of course impossible to prove a negative. 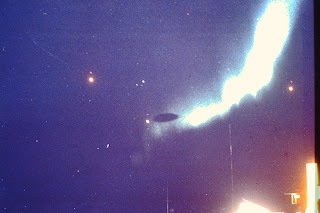 UFO pictures have always attracted me for the visual content of some of them. Marvelous shapes tinted with lovely colors. UFOs? Damn it. It is the image that appeals to me. These are probably the roots of why I started the FOTOCAT project back in the year 2000, 12,000 cases ago. Well, one of these pictures, never printed in color before, was taken in February 1977 in the Greenland Naval Station (Denmark) by a national serviceman. He was taking photos of a display of the northern lights (aurora borealis) over the base when he spotted a black silhouette in the night’s black background. After a one-minute time exposure, the object was not seen anymore. In English, it was published in the June-July 1984 issue of the CUFOS Associate Newsletter by the sighting’s investigator Kim Moller Hansen, of the Danish UFO organization SUFOI. The elliptical-shaped object was considered to be a lenticular cloud, typical in those latitudes. Lots of examples of similar lens-shaped, dark clouds in the region can be found after some “googling”. Now, I have kindly received from the current SUFOI photograph archive’s master Ole Henningsen all the pictures taken that day. Below, I am showing the original picture and one enhanced in contrast to highlight the cloud’s profile (with a green aurora turned to white and overexposed). For your enjoyment. 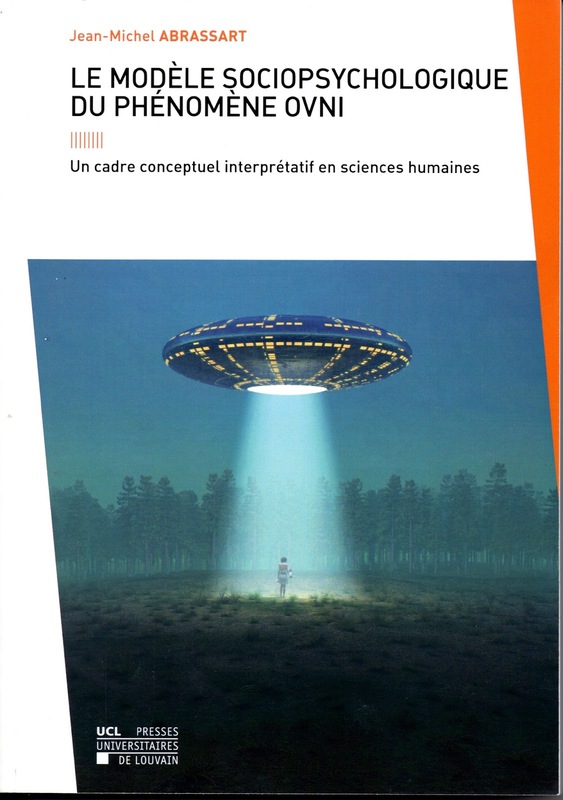 The goal of this PhD thesis is to present what we can currently say about the belief in the extraterrestrial origin of UFOs from a human sciences point of view. We will defend the Psychosocial Model, which tries to explain sightings, abductions and waves in a prosaic manner. It comes from the general project of anomalistic psychology, which seeks to explain the paranormal without invoking paranormal processes. We will deconstruct the ufological discourse based on our participating observation of this community. A special focus will be placed on the Belgian UFO wave (1989-1992), about which we will argue that it is possible to explain it as a mass delusion. Independent of bias in content, author’s beliefs or editor’s motivations, regional books are particularly welcome as they focus on a single country or region and consolidate most of the information known for that part of the world. Usually, UFO sightings unknown to the majority of foreign researchers are disclosed, or extensive new details for previously poorly documented cases are available. 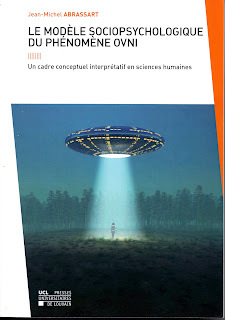 In this context, I wish to mention two titles recently released by Philip Mantle’s publishing house, Flying Disk Press, covering European countries whose minority languages have–albeit with exceptions‒prevented local UFO information becoming widely known. In both cases, and this is added value, the writers are long-time investigators. No one would have believed, in the years following World War II that the combination of sensationalist journalism, fear of an atomic conflict, and fascination with space exploration would create the cultural broth that would allow the emergence of the idea that extraterrestrial beings are visiting us on board spacecraft known as flying saucers. 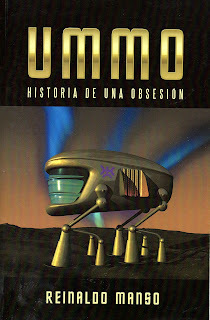 Although this imagery had arisen in the United States, the formation of the belief in flying saucers in Brazil has its own history, which is told in this book. Rob Mercer es el director de la Miami Valley UFO Society, una agrupación de ufólogos radicada en Ohio. En el año 2013 descubrió un anuncio en internet que vendía fotos y documentos procedentes de los archivos del Proyecto Libro Azul de la USAF. Naturalmente, los compró. El anuncio, que procedía de Centerville, una población al sur de Dayton, que fue la sede del Blue Book, revelaba que los materiales procedían de un antiguo oficial de aviación que estuvo asignado al proyecto OVNI de las FFAA estadounidenses. Esos documentos se habían encontrado por casualidad tras una pila de metal de plomo que se había vendido en la subasta de un garaje en Fairborn, Ohio. Y, en efecto, fueron propiedad del Teniente Segundo Carmon L. Marano, que estuvo destinado en el BB y del que fue su último jefe, entre febrero de 1969 y enero de 1970. Al enterarme de este fortuito hallazgo y de esta afortunada adquisición, me puse en contacto con el señor Mercer y le expliqué en qué consiste el Proyecto FOTOCAT. Me respondió desplegando un inusual y generoso sentido de la colaboración y desde hace poco ha comenzado a transferir a nuestros archivos digitales escaneados de alta resolución de una gran cantidad de fotografías que forman parte de esos valiosos archivos, cuyo contenido todavía no se ha terminado de explorar. Por suerte, ese material no se ha perdido y gracias a la cooperación de Mr. Mercer van a poder añadirse a la ya vasta base de datos FOTOCAT. Foto del personal del Proyecto Blue Book. Sentado, el Mayor Hector Quintanilla, y de pie justo detrás, el teniente Carmon Marano. Cortesía de Fran Ridge. 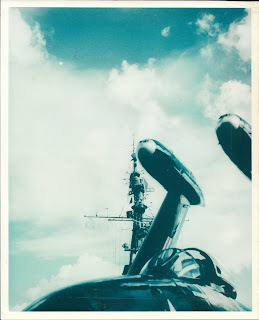 Una de las fotografías de los archivos del Blue Book: Mar del Norte (Noruega), a bordo del portaaviones USS Franklin D. Roosevelt, 19 de septiembre de 1952, a las 16 horas. © Wallace Litwin. Como es bien sabido, en 1992 el jefe del Estado Mayor del Aire ordenó el traslado de la documentación existente en el Ejército del Aire sobre “objetos volantes no identificados” al Mando Operativo Aéreo (MOA, base aérea de Torrejón de Ardoz). Así se inició el proceso de desclasificación. En el MOA, la Sección de Inteligencia fue la encargada del estudio de la información, la preparación de la normativa adecuada y la presentación de los expedientes a desclasificar, siendo los tenientes coroneles Ángel Bastida Freijedo y Enrique Rocamora Aniorte los oficiales que se ocuparon de dicha función. Entre 1992 y 1999 se procesaron cerca de 2.000 páginas de documentos relativos a avistamientos de supuestos ovnis, ocurridos entre 1962 y 1995. La totalidad de la información fue desclasificada y los informes han estado disponibles para la consulta del público en la biblioteca de la sede del cuartel general del EA, en la madrileña calle de Romero Robledo. Para acceder a los informes no hay más que escribir “Expedientes OVNI” en el recuadro “Búsqueda” y luego pinchar en “BUSCAR”. Tan fácil como eso. La página de Presentación de la web ha tenido la gentileza de reproducir una entrevista que concedí a la Revista Española de Defensa en enero de 2001. Los tenientes coroneles Ángel Bastida (izquierda) y Enrique Rocamora flanquean a V.J. Ballester Olmos. Cuartel General del Ejército del Aire (Madrid), 1999. Video: M.P. Dávila. Tratamiento de imágenes: David G. López/Mercedes Pullman. En diciembre de 1968 la 3ª Sección del Estado Mayor del Aire (EMAIRE) remitió a los jefes de las regiones y zonas aéreas del Ejército del Aire la Circular 9266-CT, Referencia S.1.7, sobre “Normas de investigación y tratamiento de los avistamientos Ovni”. Los casos que les fueran notificados debían ser objeto de información y los informes correspondientes, con la clasificación de “Confidencial”, debían ser enviados a la atención del Jefe del Estado Mayor del Aire en el cuartel general del EA. Esas eran las órdenes. Siempre he sostenido que las unidades del Ejército del Aire seguían a rajatabla este procedimiento. Por eso, en el EMAIRE se ha acumulado toda la información recibida hasta su desclasificación en los noventa. Que esto se hacía sistemáticamente lo atestiguan muchos escritos oficiales. 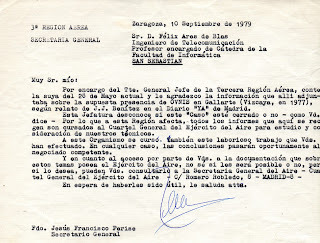 Recientemente estaba repasando mi archivo de uno de estos casos militares cuando encontré esta carta que mandó en 1979 la III Región Aérea al investigador Félix Ares de Blas, doctor en telecomunicaciones y profesor de la Facultad de Informática de San Sebastián, a raíz de un informe que su equipo había hecho de los falsos “aterrizajes” en Gallarta (Vizcaya) en febrero-abril de 1977. Por lo que a esta Región afecta, todos los informes que aquí se recogen son cursados al Cuartel General del Ejército del Aire para su estudio y consideración de nuestros técnicos. Sé que al que no quiere atender a razones ‒por intereses espurios‒ esto no le va a convencer, pero el lector razonable puede comprobar que mis afirmaciones están todas avaladas por documentación pública, lo que no se puede decir de las manifestaciones de otros. Valga esto para que conste. Pese a lo sostienen los afectados por la paranoia conspirativa, la realidad es siempre más sencilla, razonable y justificable de lo que parece. En lo tocante a documentación de origen militar sobre ovnis, por ejemplo, sabemos que algunos informes o fotografías no se han encontrado. Naturalmente, hablamos de sucesos ocurridos muchos años antes de que los archivos del Ejército del Aire se transfirieran desde la División de Operaciones del Estado Mayor del Aire (Cuartel General, Madrid) a la Base Aérea de Torrejón (sede del Mando Operativo Aéreo, MOA), en enero de 1992. En ocasiones se debió a que no se siguieron las precisas instrucciones de las que he hablado en la sección anterior. En otros casos, fueron archivos destruidos por obsolescencia o sencillamente perdidos. Pero puede haber otras razones. · La película tomada en un vuelo de Iberia el 15 de mayo de 1968 entre Tenerife y Paris. Se trató de un globo sonda del CNES francés. · Los negativos de la foto de un amanecer el 12 de noviembre de 1979 en la que aparece un reflejo solar de forma circular. Ninguno de esos materiales estaba en los archivos cuando éstos llegaron al MOA. La explicación más razonable de su ausencia es que, al haberlos manejado muchas manos durante años, no se guardaron debidamente con el resto de los informes o se extraviaron en traslados internos o incluso durante la devolución a su propietario, en los 25 o 14 años transcurridos, respectivamente, hasta su expedición definitiva al MOA. Pero hay otra razón, más contingente, que no podemos obviar: que alguien se quedara con ellos. Avala esta suposición el hecho de que, por ejemplo, un veterano general que estuvo relacionado con los avistamientos canarios del 5 de marzo de 1979 (debidos a la observación de misiles Poseidón de la Marina de los EE.UU.) me entregó un archivo en el que había algunas copias originales de las fotografías tomadas aquel día. 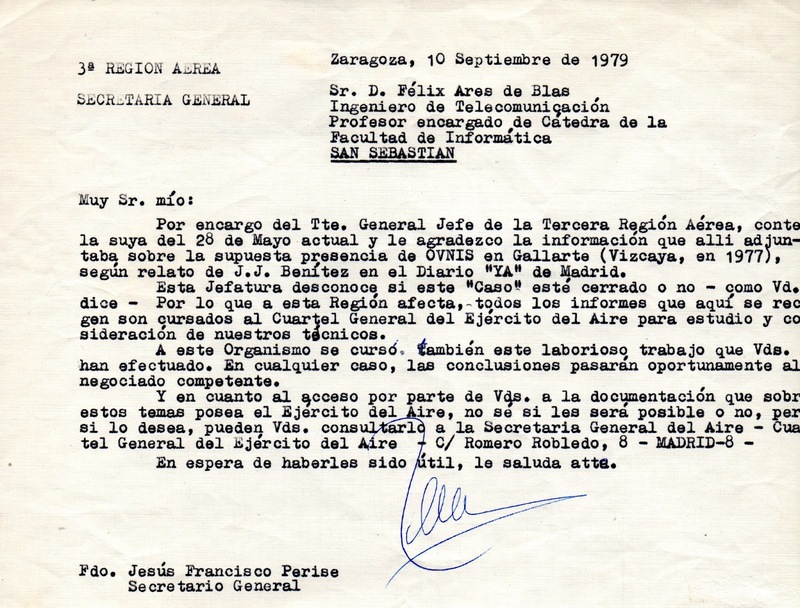 Desde entonces pensé que otros documentos podría conservarlos (e incluso tenerlos olvidados) alguno de los muchos oficiales que estuvieron de alguna forma vinculados con los expedientes ovni entre 1962 y 1992. Esta reflexión la hago a resultas de algo que acaba de conocerse, el inesperado hallazgo de informes, correspondencia, fotos y películas pertenecientes a los archivos del proyecto Blue Book de la fuerza aérea norteamericana y que guardaba en su domicilio el teniente Carmon L. Marano, de lo que ya hablé anteriormente. Según parece, el antiguo oficial se había deshecho de trastos viejos, entre los que se encontraban, inadvertidamente, estos papeles. Esto confirma mi sospecha de que la pérdida de algunos materiales no se debe a la acción de ninguna mano negra deseosa de que no tengamos acceso a una cierta información, sino a causas más frívolas o mundanas. Sobre todo cuando, como en las pérdidas citadas, son absolutamente irrelevantes para el estudio del fenómeno ovni, al ser casos de elemental explicación. Las fotos de ovnis siempre me han atraído considerablemente, mayormente por su contenido visual. Formas maravillosas teñidas con colores preciosos. ¿Por ser naves extraterrestres? ¡Qué diablos! Es la imagen lo que me seduce. Esas son probablemente las raíces por lo que comencé en el año 2000 el proyecto FOTOCAT, hace ya 12.000 casos. Bueno, una esas fotos, que nunca ha aparecido en color con anterioridad, se tomó en febrero de 1977 en una estación naval de Groenlandia (Dinamarca) por un militar nacional. Estaba sacando fotos de un despliegue de auroras boreales sobre la base cuando observó una silueta negra en el sobre el cielo nocturno de fondo. Tras una exposición de un minuto, dejó de ver al objeto. En inglés, el caso se publicó en el número de junio-julio de 1984 de la CUFOS Associate Newsletter, en un artículo firmado por el investigador del avistamiento, Kim Moller Hansen, de la organización danesa SUFOI. El objeto de forma elíptica se consideró sin la menor duda una nube lenticular, muy típica de aquellas latitudes. Se pueden encontrar en aquella región del mundo numerosos ejemplos de nubes oscuras en forma de lente simplemente “googleando” en la red. Gracias a la gentileza de Ole Henningsen, el actual gestor de los archivos fotográficos del SUFOI, he recibido todas las fotos del caso que se tomaron aquella noche. A continuación muestro la fotografía original y otra con el contraste retocado para hacer más visible el perfil de la nube (donde la aurora verde aparece ahora sobrexpuesta y de color blanco). Para su disfrute. El objetivo de esta tesis doctoral es presentar lo que podemos afirmar actualmente acerca de la creencia en el origen extraterrestre de los ovnis desde el punto de vista de las ciencias humanas. Vamos a defender el Modelo Psicosocial, que trata de explicar los avistamientos, las abducciones y las oleadas de forma convencional. Se inscribe en el proyecto más general de la psicología anómala, que busca explicar lo paranormal sin invocar procesos paranormales. Vamos a deconstruir el discurso ufológico sobre la base de nuestra activa observación de esta comunidad. Se prestará especial atención a la oleada ovni belga de 1989-1992, sobre la que sostenemos que es posible explicarla como un delirio de masas. Nadie habría imaginado, en los años siguientes a la segunda guerra mundial, que una combinación entre periodismo sensacionalista, el miedo a un conflicto atómico y la fascinación por la exploración espacial produjera un caldo de cultivo que permitiría el surgimiento de la idea de que seres extraterrestres nos estarían visitando a bordo de naves espaciales conocidas como platillos volantes. A pesar de que ese escenario surge en los Estados Unidos, la formación de una creencia en los “discos volantes” en Brasil tiene su historia propia. Esta es una novela del investigador Luis R. González, que firma con sus segundos nombre y apellido: Reinaldo Manso. Se trata de una simpática obra de ficción, de agradable lectura, con el trasfondo del mundialmente conocido tema UMMO, en donde vemos mezclados algunos nombres de investigadores e informes de avistamientos reales, junto con personajes y situaciones imaginarias pero que se enlazan con personas y hechos familiares en este mundillo internacional de los ovnis. 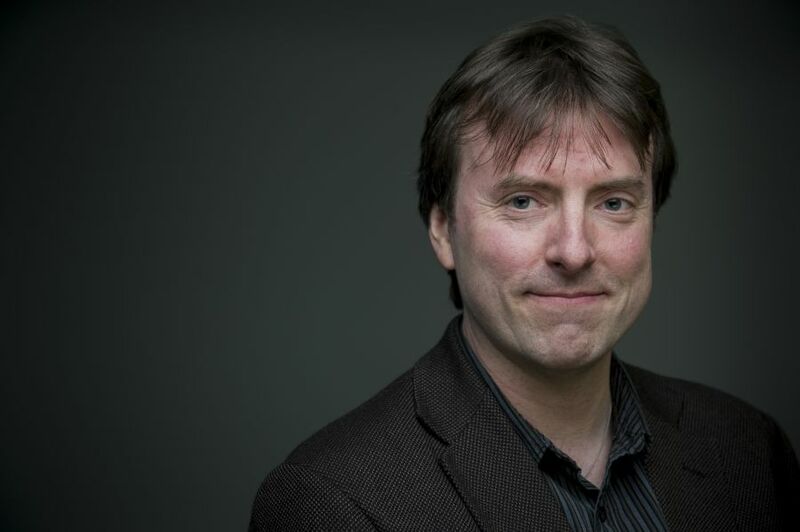 El autor ha debido divertirse mucho escribiendo esta novela y ha sabido transmitir esa sensación al lector. Lectura de entretenimiento que recomiendo para las vacaciones de primavera, verano, otoño o invierno. Y ahora toca buscarme, a ver adonde y como aparezco. Y como se suele decir, en las mejores librerías. Con el trasfondo de la desclasificación española de los años noventa y la reciente subida a internet de los expedientes digitalizados, los medios de comunicación han incidido en la historia y actualidad de los ovnis y los militares en España. A resultas de eso, he concedido algunas entrevistas cuyo contenido puede ser de interés general.